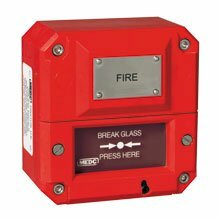 This manual fire alarm call point has been designed for use in flammable atmospheres and harsh environmental conditions. The GRP enclosure is suitable for use offshore or onshore where light weight combined with a high level of corrosion resistance is required. Certified temperature: –40°C to +50°C (Model dependent). Breakglass hammer available (Contact sales office for details).